An unconventional spiritual autobiography, told in a remarkable, outspoken voice and rooted in the messy realities and questions the ’ordinary time’ of one woman’s life, from infidelity to living with multiple sclerosis, to death, to renewing a marriage. “This is the remarkable story of a woman who faces the vicissitudes of life with honesty, courage, and, ultimately, commitment. Hers is no easy or ideal life: her own adultery, her husband’s adultery, his cancer, her multiple sclerosis, and her spiritual struggles, including bouts with clinical depression, culminate in an affirmation of marriage, life, and love that inspires Mairs to a stronger commitment. She struggles with self-image, with images of God, and with fears of loss and pain. Poignantly, she learns that she can love her husband `’more often than not, in a way that reflects the love of God,’’ a sentiment that is tested when he is unfaithful. 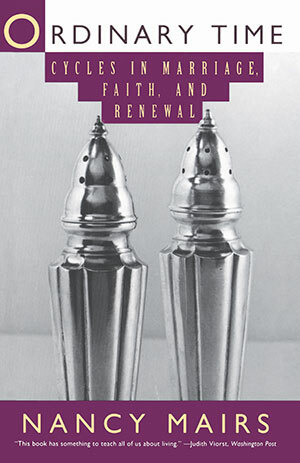 Mairs also finds feminism, Roman Catholicism, and sacrament in ways that inspire.” Recommended for public and seminary libraries.